My December account statements finally came in and like I’ve done each year for some time, I’ve calculated my return for the year. Because of the new CRM2 rules, my account statements give my annual return, but it’s done separately for each account. I think of my portfolio as a whole that just happens to be spread across multiple accounts. It was an above-average year. My internal rate of return (IRR) that takes into account cash flows was 13.65%. As a benchmark, I use Vanguard ETFs in the same asset allocation as my portfolio and compute the IRR with the same cash flows. Because I actually own Vanguard ETFs, my return doesn’t differ much from this benchmark. The only exception from indexing in my family portfolio was a small block of Berkshire Hathaway stock that my wife held for years, but sold in October. I use ETF VTV as a benchmark for Berkshire. My portfolio’s benchmark return was 13.62%. This is a hair below my actual return, so Berkshire outperformed VTV somewhat. If my portfolio had started the year at exactly my target asset allocation and I never touched or added or took out any money, my return would have been 13.39%. This is below my benchmark return, which means that I got lucky with the timing of my cash flows; I tended to add money when my stocks were a little down. There was no skill at all in this because I add new money with fixed rules – no discretion on my part. If I use the benchmark index returns that Vanguard provides for each of its ETFs, the tracking error of my portfolio works out to 0.03%. For some reason, this is lower than my portfolio’s blended MER of 0.08%. I assume this is some combination of luck and possibly revenue from Vanguard lending shares to short sellers. One of my ETFs, VXUS, has foreign withholding taxes. Non-U.S. countries retain a withholding tax on stock dividends before the rest of the dividends go to Vanguard in the U.S. Currently, this tax is a 0.20% annual drag on VXUS returns. Because VXUS makes up 25% of my portfolio, foreign withholding taxes are a 0.05% additional drag on my portfolio’s returns. By holding my ETFs in RRSPs, TFSAs, and non-registered accounts strategically, I have no other drag due to foreign withholding taxes. Other drags on my portfolio’s returns are trading commissions and spreads. In 2016, this added up to about 0.03%. The new CRM2 rules made it easy for me to find the total commissions I paid. Spread costs took more work. This cost is half the average bid-ask spread times the total number of shares traded. For infrequent traders of very liquid ETFs, this doesn’t amount to much. So, what’s the point of all these comparisons if the differences are so small? The point is to make sure they’re small. If my portfolio has a leak, I want to know about it. You’ll notice that I had a spectacularly good 1999. That was the result of a wild bet on a single stock that grew to be a very large percentage of my net worth. I was very lucky. You may also notice that my returns didn’t look very good from 2000 to about 2010. This is roughly the period where I picked stocks. All I succeeded in doing was to give back some of my 1999 gains. Since 2010, my portfolio has been mostly indexed, which is why there is little difference between my returns and the benchmark. Over the entire period, my average compound return has been 8.65% above inflation. It feels good to know that every dollar I’ve had invested the entire time has grown over six-fold in purchasing power. Going forward, I hope to average about 4% (less costs) above inflation. I outperformed my benchmark by a compound average of 3.09% per year. But if we exclude 1999, I actually lost to the benchmark by 0.95% per year. I was lucky, and after that I wasn’t much of a stock picker. Particularly painful was a decision to sell a sizeable block of Apple stock at a split-adjusted price of $1.39. It now trades at about $120. I’m very content with my choice to index my portfolio. It’s not necessary to go into the detail that I do when analyzing your annual returns. However, completely ignoring them is a mistake. Few investors know their annual returns. CRM2 will help some, but I’m willing to bet that if you ask someone about their returns, they’re likely to talk about their account that performed best. 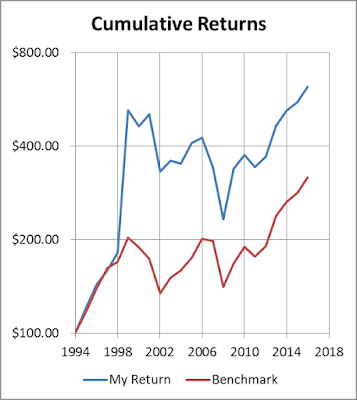 Comparing your return to a benchmark may not tell you much in any given year, but there’s one pattern to watch for: if you trail an appropriate benchmark fairly consistently by about 2% per year, you may be invested in closet index funds. These are funds that pretend to be active and trying to outperform, but are actually just invested in a mix of stocks or bonds that closely match an index. If you’re trying to get above-average returns, you should know whether it’s working or not. Otherwise, you’re just fooling yourself. Justin’s calculators don’t actually “track your portfolio returns more accurately.” Your money-weighted return is a good measure of the return you got. But comparing it to a benchmark mixes the results of your active decisions with cash-flow luck. Justin is trying to reduce this luck factor to isolate whether your active portfolio decisions made or lost money when compared to a benchmark. If you happen to get a bonus at work that you invest when the markets are low, then the boost to your return is just luck. You can get unlucky as well with when you have new money to add at a market high or need to make a withdrawal at a market low. At first I thought Justin was claiming that the Modified Dietz method of calculating returns is time-weighted (but I’m guessing that’s not what he meant). It is clearly money-weighted. 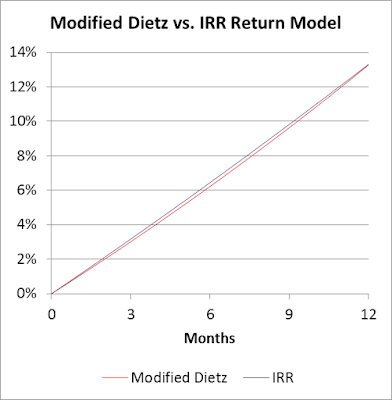 Modified Dietz is just a way to approximate the Internal Rate of Return (IRR) method, which is also money-weighted. 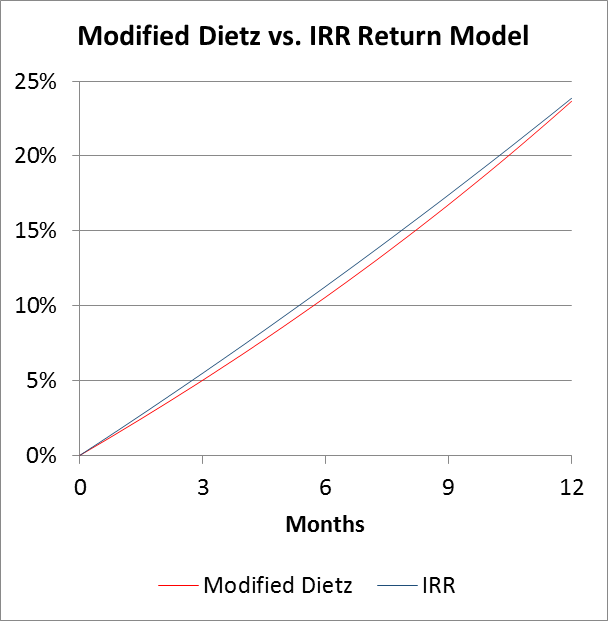 Modified Dietz’s only virtue is that it’s easier to calculate than an IRR. Justin’s calculator tries to remove the cash-flow luck factor by calculating a time-weighted return rather than a money-weighted return. One catch in calculating a time-weighted return is that you need to know your portfolio value each time you add or remove money from your portfolio. But, account statements usually only have month-end portfolio values. This is where the Modified Dietz method comes into play. What Justin is actually doing with his calculators is using month end portfolio values together with Modified Dietz to approximate the time-weighted return for each month of the year. He could just as easily have used the IRR method for each month. Then he compounds the monthly returns to get an estimate of the time-weighted return for the whole year. All this doesn’t mean that the return Justin’s calculator gives is somehow more accurate than the money-weighted return that will appear in your account statements under the new CRM2 rules. 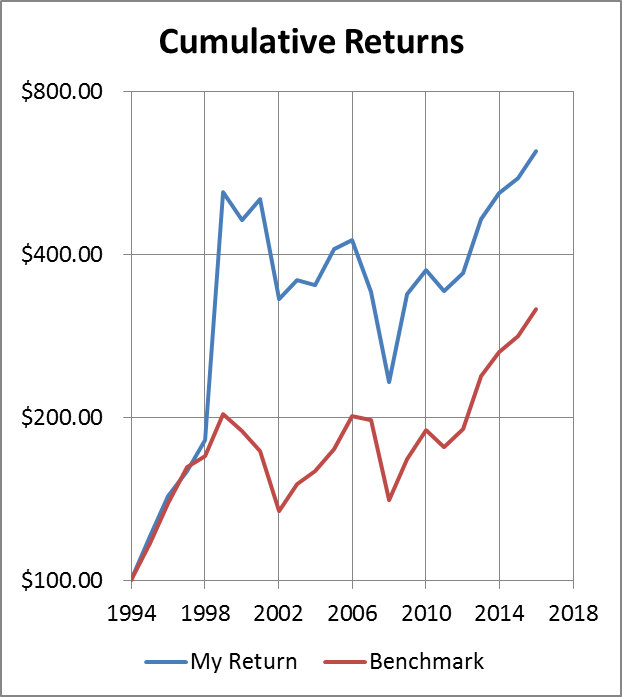 When you compare your return to a benchmark, Justin’s method of calculating your return does a better job of isolating the value of your active portfolio decisions. If you just compare your money-weighted return to the benchmark return, you might be mixing in a significant cash flow luck factor. Although, as I’ll show, Justin’s calculator doesn’t eliminate this luck factor completely. If you’re going to use Justin’s calculator, you have to make sure to apply cash flows correctly. If you have new money available to invest, but try to time your entry, that’s an active decision. So, you should treat the new money as entering the portfolio immediately, but sitting in cash. So, the date of cash entry in Justin’s calculators should be the date the money was available to invest, not the date it was used to buy equities. Justin’s method of measuring the value of your active portfolio decisions is just one method. He does it by adjusting your return to remove most of the cash-flow luck. Another method is to compute a benchmark return that takes into account your cash flows. With this method, you compute a return as though your portfolio was on auto-pilot being invested in a benchmark. Each cash flow leads to a trade in the benchmark index. This gives an adjusted benchmark index that you can compare directly to your money-weighted portfolio return. One virtue of this method is that it’s usually easy to find benchmark values for any day of the year and not just month-ends. So, you can more accurately remove cash-flow luck when you compare this adjusted benchmark return to your actual money-weighted return. XYZ index fund had a decent year, but it wasn’t steady. By June 30 it had lost 20%, but later rallied. It finished both August and September down 10%, but briefly hit break-even on September 15. An end-of-year rally left the fund up 10% for the year. Tim had $15,000 in XYZ fund to start the year. He had another $8000 available to invest on June 30 but with XYZ falling, he got nervous and waited until September 15 to invest the $8000 in XYZ. We’ll treat XYZ index fund’s 2016 results as Tim’s benchmark. On September 15, Tim had $15,000 in XYZ fund and added another $8000. Then the fund went up 10%, leaving Tim with $25,300. Tim’s IRR for the year is 13.31%, and his Modified Dietz return is 13.27%, not much different. They’re both much higher than XYZ fund’s 10% return, so Tim looks like a genius, but this comparison mixes in cash-flow timing luck. If Tim had just invested the $8000 right away instead of waiting for “things to calm down,” he could have ended up with $27,500. That’s $2200 more than he actually got. His IRR could have been 23.9%, and by the Modified Dietz method, it would have been 23.7%. Either way, that’s a much higher return than Tim actually achieved. This is an example of adjusting the benchmark return for Tim’s cash flows to isolate his skill, such as it was. Any reasonable analysis would conclude that Tim’s market timing effort was a failure. Even though his return is higher than XYZ fund’s 10% return, that’s just because of the lucky timing of his added $8000. In fact, he squandered most of his luck by waiting 3 months to invest it. The comparisons that make Tim look smart just show that his good luck was greater than the poor skill he showed. The idea of time-weighted returns is to eliminate the effect of cash flows in and out of a portfolio. The idea is that if portfolio managers can’t control when you put money in or take it out, they shouldn’t get credited or penalized by the effect of cash flows. We measure time-weighted returns by breaking up the year based on when the cash flows occur, calculating the return for each interval, and compounding the returns. In Tim’s case, if we ignore his market timing mistake for the moment, his return up to September 15 was 0%, and for the rest of the year was 10%. This compounds to 10%, the same as XYZ fund’s return for the year. It’s no coincidence that the time-weighted return matches the fund’s return. After all, the goal was to eliminate the effect of cash flows. If Tim had invested the $8000 right away, his return after 6 months would have been -20%. The return from then to September 15 would have been 25%, and 10% for the rest of the year. Once again, these returns compound to 10%. Let’s return to the case where we recorded the cash flow on September 15 and ignored the poor market timing. The actual time-weighted return is 10%. However, Justin’s calculator computes it as 5.0%. This is because the calculator did not have the portfolio value on September 15 and had to try to estimate September’s time-weighted return. The calculator essentially treats the cash flow as happening with the market down 10%, when it was actually at break-even. And when the final portfolio value doesn’t reflect this apparent good luck of buying low, the calculator gives a low return. This is what I mean when I say that the calculator doesn’t completely eliminate cash-flow timing luck. Ordinarily, the error is smaller than it is in this example of wildly fluctuating returns, but the error will still be there in most cases. To get Tim’s true time-weighted return, we should really be taking into account the $8000 Tim let sit for 3 months gathering no interest. Looked at this way, Tim’s return for the first 6 months was -20%, at which point the new $8000 made his total $20,000. This grew to $23,000 by September 15 for a 15% gain. Finally, he made 10% in the rest of the year. These returns compound to 1.2%, much less than the benchmark return of 10%. So, the time-weighted return method agrees that Tim’s market timing hurt his returns, but it has to be calculated with the cash flows at the correct times. In this case, Justin’s calculator correctly calculates the time-weighted return as 1.2%. That is because the only cash flow during the year happened at the end of a month. So, there was no error due to not having the correct portfolio value on the date of a cash flow. There is some possible confusion when it comes to the definition of a time-weighted return. To understand this, we have to go back to the Simple Dietz method of calculating investment returns. This method just treats all cash flows during the year as though they happened at mid-year. The idea is that if you are making regular contributions, the average contribution happened roughly at mid-year. To make this calculation more accurate, the Modified Dietz was born. This method weights each cash flow by how much of the year is left when the cash flow happens. So, Tim’s contribution on September 15 with 3.5 months left in 2016 gets a weight of 3.5/12. With Simple Dietz, all cash flows get weight 1/2. This time-weighting used in Modified Dietz is not the same as “time-weighted returns.” The fact that they use the same words is a potential source of confusion. 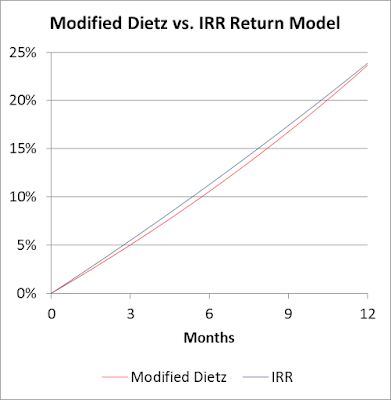 Both Simple Dietz and Modified Dietz are money-weighted methods of calculating returns. In the case of the internal rate of return (IRR), we define “steady” as a return at a fixed compounding rate throughout the year. Getting back to Tim’s example above, if he had invested in a fund that produced a steady compounding return of 13.31% per year, he would have ended up with the same amount of money as investing in XYZ fund with his cash flows. One of the criticisms of the IRR is that it sometimes doesn’t give a single answer. But this only happens in wild situations where any measure of portfolio return is meaningless. An example is a portfolio that starts with $10,000, grows so wildly that it’s possible to withdraw $36,000 after 4 months, and after adding $43,100 at the 8-month mark, drops crazily to $17,160 at year-end. Three different IRR returns fit this data: 33.1%, 72.8%, and 119.7%. In almost all portfolio situations that happen in real life, IRR gives just one answer. 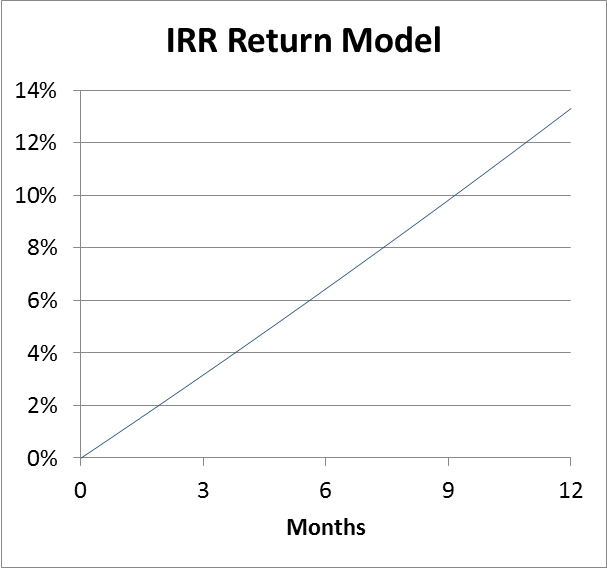 The following figure shows the steady IRR compounding return model. It might look like a straight line, but it’s actually increasing exponentially. If we extended it for a few years, this would be easier to see. 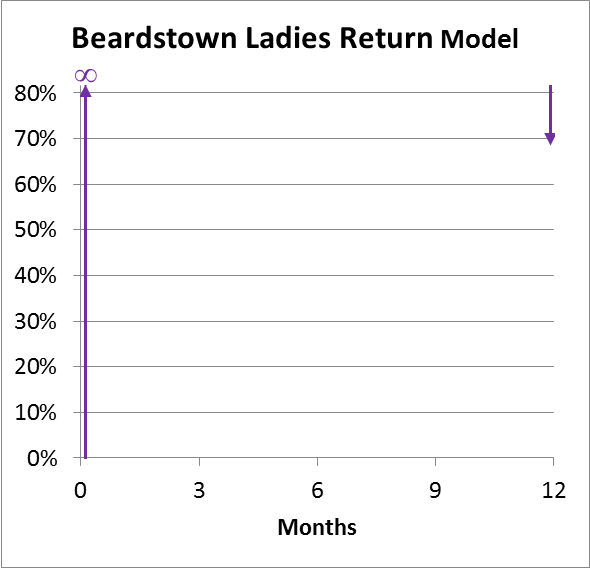 For the Modified Dietz method of calculating returns, we define “steady” as a kind of reverse simple interest. Instead of the return to date being proportional to time elapsed, the return to the end of the year is proportional to the time remaining. This creates a hyperbolic curve. If Tim had invested in a fund whose returns were of this form that ended the year at 13.27%, he would have ended up with the same amount of money as investing in XYZ fund with his cash flows. 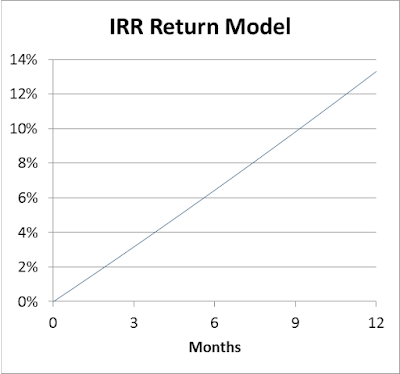 The following figure overlays this reverse simple-interest pattern on top of the earlier compounding pattern for the IRR calculation. The difference between them is tiny, and it’s not hard to see why IRR and Modified Dietz gave very close to the same calculated return. 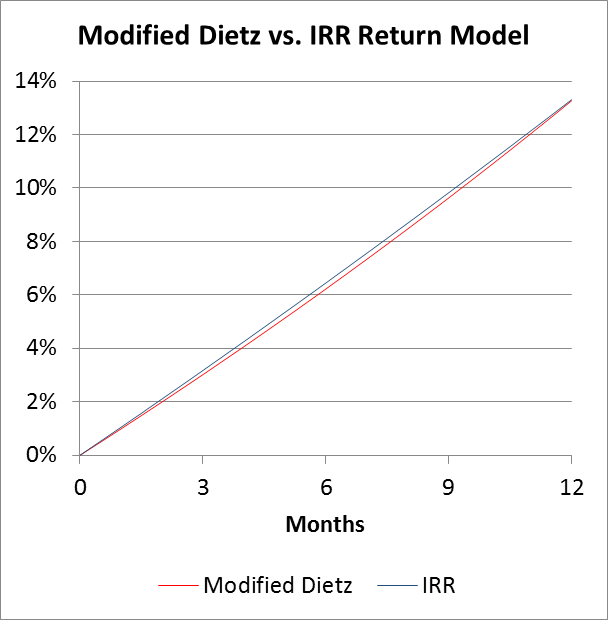 If Tim had invested the $8000 as soon as it was available, his IRR would have been 23.9%, and the Modified Dietz return would have been 23.7%. The following chart shows the compound interest and reverse simple-interest patterns. Now we see a slightly larger difference between the curves. This is because the difference between simple interest and compound interest is greater as interest rates rise. But it’s still not a big difference, and it’s not hard to see why they give close to the same results. 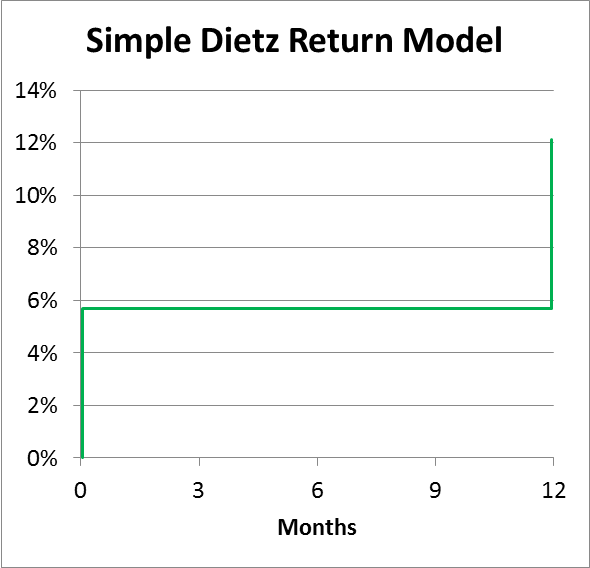 The Simple Dietz method has a more basic definition of “steady.” It has close to half the year’s return appear in the first instant of the year, and the other half at the last instant of the year. This method says Tim earned 12.1%. The following chart shows this return pattern. 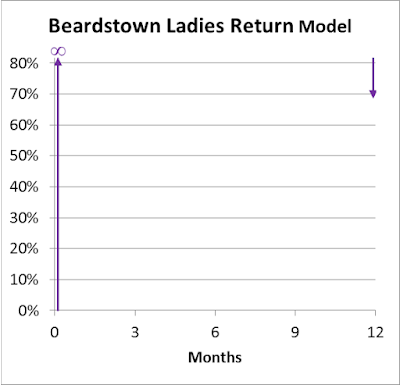 An investment club called the Beardstown Ladies had their own method of calculating returns. They just ignored new contributions, effectively treating them like part of the investment return. By this flawed method, Tim earned a 69% return! Their implied definition of “steady” has the investment return leap to infinity in the first instant of the year, and then drop back down to earth in the last instant of the year (see the chart below). This way, any cash flows have no impact because the portfolio value is infinite. If the $8000 cash flow has no impact, then the only way Tim could grow his $15,000 to $25,300 is with a 69% return. There is nothing wrong with using the internal rate of return method to calculate your personal returns. This is what the new CRM2 rules will give you. The Modified Dietz method and time-weighted methods of calculating returns are not more accurate if you just want to know how your portfolio did. However, just comparing your portfolio’s return to a benchmark can be misleading, depending on what you’re trying to measure. Being higher or lower than the benchmark can be just a matter of luck in the timing of when you had money available to invest or when you needed to make withdrawals. To isolate the value of your active investment decisions, you need to factor out the luck of cash-flow timing. One way to do this is to compute your time-weighted return and compare it to a benchmark return. Another is to compare your actual return to what you return would have been if you had invested on auto-pilot in a benchmark. Investing on auto-pilot won’t give you exactly the benchmark return if your portfolio had cash flows. Your personal benchmark requires a return calculation based on what your cash flows would have been if you hadn’t used any of your own discretion. You have to remove the luck factor for things you didn’t control to get at a measure of the results of the things you did control. It’s not too hard to add up all the money you’ve been paid over the months or years. For anyone who has worked for a least a few years, the total will look impressive. So, where is it? Obviously, we need to spend some of it to for food, clothing, and other necessities, and there’s nothing wrong with a few indulgences, but surely there is something left of all that money. Or maybe not. One good answer to this question is savings. If you can say, “I’ve been saving for 5 years now, I’ve got no debts, and I have a portfolio worth nearly $50,000,” I’d say you’re in good shape. Another good answer is equity in your home. But don’t mistake mortgage payments for saving. The interest is gone. Principal is what matters. And if you’ve re-advanced your mortgage or taken on a line of credit for a new kitchen, you may not have anything to show for your years of collecting pay cheques. For young people working their way through school, a possible good answer is a degree. If working part time while going to school meant you didn’t need student loans (or the work allowed you to borrow less), you can say that you have a degree to show for your efforts. A pension is a good answer. I think it makes sense to build at least a modest amount of savings in addition to a pension, but pensions are certainly valuable. Some people build debt knowing that they’ll be able to make debt payments with future pension income. This is almost always a mistake. Pensions are great, but don’t pre-spend them. A poor answer is stuff. If you’ve got an iPhone and a car with little residual value, you don’t have much. Stuff rarely brings happiness for very long. It’s sad to say that all you have to show for years of hard work is a bunch of stuff. Pointing to experiences is not a good answer to the question of what you have to show for your years of pay. I’m a fan of spending money on experiences rather than stuff, but experiences won’t put food on the table. It’s possible to have great experiences while still saving some money. You should have something more tangible to show for your work. A possible emotional answer is family. Children certainly are expensive. But using them as an excuse for not saving any money won’t help much in the future when lack of savings limits your family’s choices. It’s best to find a way to have a family and save some of your income. Some people genuinely have trouble making ends meet for their families because of very low incomes. But more often when I hear such complaints, people have just built up lifestyles for their families that are too expensive. Advertisers like to tell us that we should buy what they’re selling because “you deserve it.” Well, I think what you really deserve is to have something tangible to show for your years of work. But that’s not going to happen unless you decide to make it happen. Instead of focusing on what you can buy with your income, focus on what you have left to show for your years of hard work. Morgan Housel explains why what looks like goofing off may be the best way to make progress. All the best things I’ve ever done in my career were achieved while I looked like I was goofing off. Unfortunately, it’s impossible to tell whether someone is in important quiet reflection or whether they really are just goofing off. Dan Bortolotti gives us a great overview of couch potato investing, including the advantages and disadvantages of different approaches. He makes a good analogy between making dinner and investing. The easiest way to invest is like eating at a restaurant. Then there’s bringing home pre-prepared food, and finally buying index ETFs is like cooking from scratch. This makes me wonder how to extend this analogy to picking your own stocks. Perhaps it’s like trying to make dinner by hunting through a rain forest looking for edible plants and animals most other people haven’t heard of before. Tom Bradley at Steadyhand trumpets the 9.4% annual return Steadyhand investors have earned over the past 5 years. This return may not seem remarkable, but keep in mind that this is the return of Steadyhand investors, not the return of their funds. Typically, investors jump in and out of funds at the wrong times. So, funds typically make better returns when they’re small than they do when they’re big. A fund’s return is typically higher than the returns experienced by the typical investor in the fund. Actual investors making 9.4% for 5 years is a good outcome and shows that Steadyhand is aptly named. I’m firmly in the camp of DIY investors using low-cost widely-diversified index ETFs, but Steadyhand stands out among the other choices investors have. In another very good post from Tom Bradley, he gives some perspective on the overcharging of investment fees at BMO, TD, Scotia, and CIBC. He doesn’t buy that the overcharging is due to simple systems errors because banks watch their revenues closely. The Reformed Broker explains how financial advisor pay grids create inherent conflicts of interest between advisors and their clients. A Wealth of Common Sense has an excellent list of the 20 rules of personal finance. Potato makes a strong case for using winter tires. My Own Advisor lays out his list of 2017 financial goals. There’s lots to like here. He plans to meet his goals without taking on any new debt. He is saving up for a car instead of waiting until he needs one and has to borrow. And he is building up an emergency fund. The Blunt Bean Counter gets a lot of experience with CRA information requests, and here he tells us about the most common types of requests for 2016. Big Cajun Man says “go away 2016,” but 2016 was a good year for me before some family health issues near the end of the year. Every year we seem to have many people who say the year ending was a bad one. That’s rarely true for me. Robb Engen at Boomer and Echo lays out his financial goals for 2017. To achieve his goals, he needs to save 40% of his income. This sounds high, but is quite reasonable when your finances are rolling along well. He’s right not to crank up his lifestyle spending.